Are you aware that the majority of people fail when creating niche websites, no matter how many efforts they put into it? What if I told you that your success is mainly influenced by just one relatively simple first step? I recently started a niche site which ranked in the top 10 search engines results for the main keywords in less than 3 months and making already sales via Amazon affiliate program (I’m going to write a case study soon, so you can reproduce exactly what I did). This was possible with a proper link building (which I’m also going to share in the niche site case study), but first thanks to a correct keyword research. In this post I’m going to explain into details how to use LongTailPRO, version 3.0 (which is currently in beta testing, and will be available to public in a few weeks. Be aware that those who buy now will automatically be upgraded to the latest version at no cost) to discover profitable keywords and let you build niche websites that make you earn a passive income online. But before going into the explanation of LongTailPRO, let me give you some tips to consider when looking for profitable keywords. These are very important points and understand them correctly can make the difference between building a successful niche website or having one of the millions of sites on the internet that do not generate a dollar, despite the big work you put into it. This is the first important factor you need to consider: a good number is from 1000 to 5000 monthly searches. But there are other parameters you need to look at. Broad Match vs Exact Match. Choose the easy way, and select the exact match. You get more accurate results, as the exact match volume, which is exactly the number of searches per month for a specific keyword. This can give you a rough idea of how much traffic you can get when ranking well for your chosen keywords. This factor is quite important if you are going to monetize your site also with Google Adsense (which I do). I have set the CPC search at $0,50. This can give you an idea of how much you can get paid per click on the ads you place on your site (around 60% of that value). In a few words, if you find a keyword with high CPC, then your traffic will be very lucrative and you can earn good money with it. This is an important value you need to pay attention to, as you don’t want to make the big mistakes many people do. Global search volume indicates the world-wide search volume while local search volume represents how many searches there are in the country your keyword research tool is set. Normally, you want to aim to U.S. traffic. You can get for example a lot of global searches, but little local search volume. Think that English is set as main internet language in many countries, but they don’t have the purchasing power of people living in United States of America. Once you have considered the “technical” points mentioned before, you need to find the topic among the keywords you have found which actually solve people problems or satisfy their needs. Just ask yourself: Would you run that query on Google? Looking at the amount of monthly searches, the first instinctive choice would be “funny cat pictures“, but if you look further into it, you’ll see that the other one, “how to cure heartburn”, with much less local monthly searches, will be much more profitable. Would you pay $100 (or much more) to cure your heartburn? Yes, of course! Now you understand the importance of focusing on a keyword related to solving internet users problems, which is by far more important than thinking just about the search volume. Buyer keywords are the ones which include some words that clearly indicate the interest and willing to buy the thing users are searching. If someone type in Google “buy cheap laptop”, means he’s looking to find the best deal in order to make the purchase. If you target this type of keyword you probably make more money. 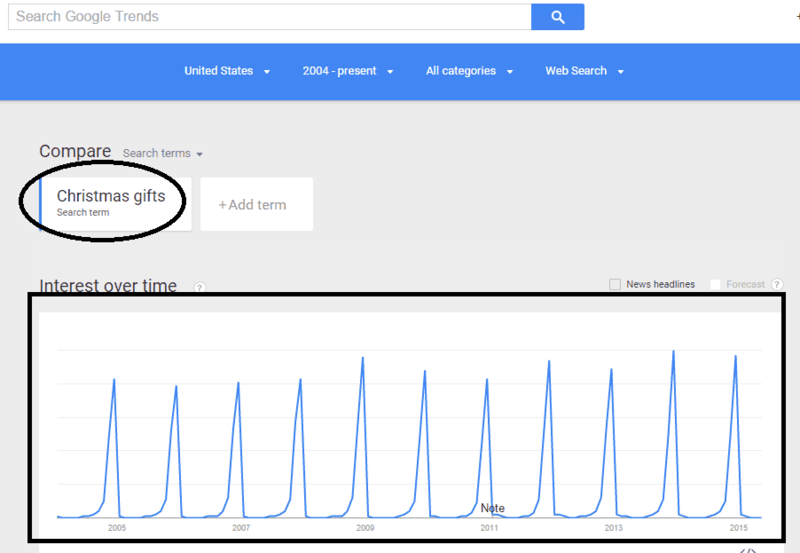 If you work on keywords like “Christmas gifts” you won’t see many searches during summer time. These seasonal keywords are based on specific events during and will not have a constant search volume during the year. 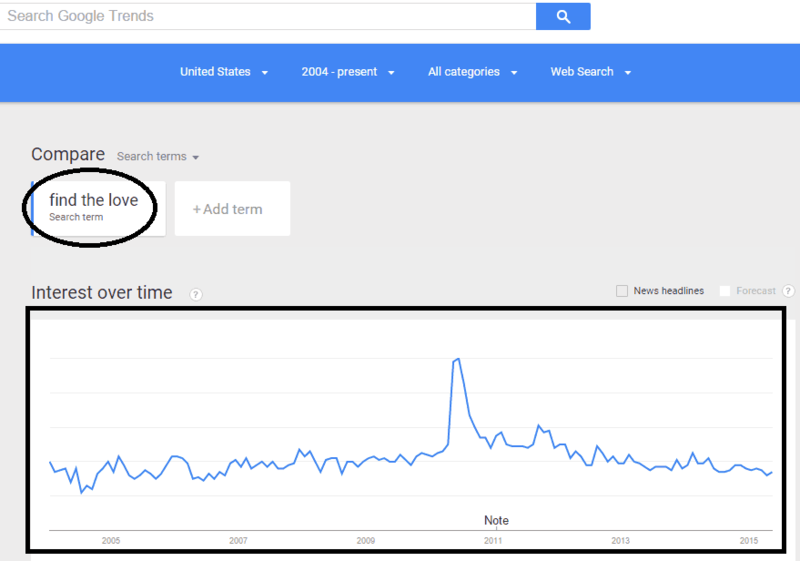 So be sure to use Google Trends to check how much will last the searches during the time period of one year and make your decision based on this finding. So now you know what are the factors to consider when choosing a profitable keyword. 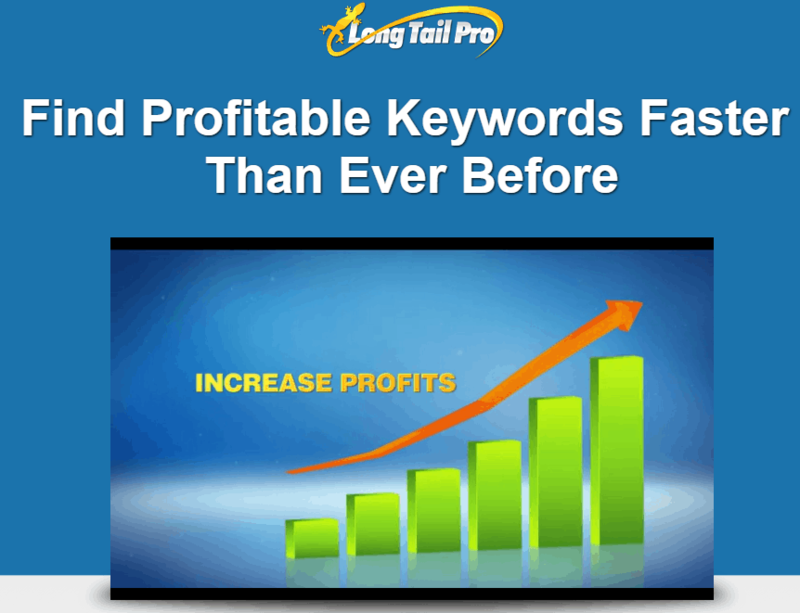 So let’s see how to find profitable keywords with LongTailPRO. 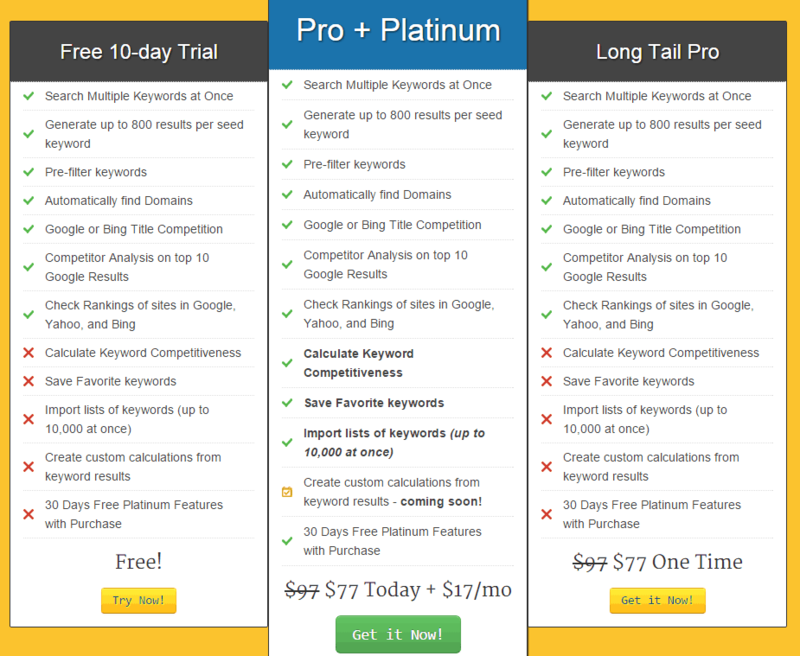 LongTailPro is a powerful keyword research software that allows you to generate tens of hundreds of unique and profitable long-tail keywords within just a few minutes of work. As already stated, I learned to master this tool during beginning of this year, and used to find great keywords to start my first niche site, monetized with Amazon affiliate program (I’m slowly adding Google Adsense too). So if you are looking for a additional passive income to add to your online activities, then you should think about LongTailPRO and how to use it, to get golden keywords and build awesome websites that make money in autopilot. Do you want to try LongTailPRO for free? Get your copy here. I’m sure you’ve heard about this software; it’s developed by Spencer Haws, who has wide experience in building niche websites that make money. This tool was created to help beginners find an easy way to get profitable keywords. If you are an internet marketer, then you know the importance of keywords and ranking in search engines, to get organic traffic, which is the one that most convert. Seeing the saturation of one/two words keywords, many people are going for a long tail one, which contain 3 or more search terms. They are more specific, but less common. These keywords are more focused on a niche. Be sure to consider that this kind search is very likely to convert that phrase into a sale. It also helps the user to make a precise buying decision. You’ll see that the probabilities of searchers using long-tail keywords to look for a specific product or service are very high, so the chances of converting the visitors landed on your site after using that query in Google (or any other search engines) are high too. They are more likely to buy from the links on your site if they find the exact information they are looing for. In other words, long-tail keywords have the power to catch the targeted buyers in the conversion cycle. And remember, long-tail keywords are much easier to be ranked in search engine as compared to common keywords (the ones with one or two words). I can make an example. Will make you find several long-tail keywords, like “green tea weight loss”. will make you find “best green tea weight loss”. Now, back in time you’d have to spend many hours looking for keyword opportunities, may be using free tools like Google Adwords Keyword Planner, or SEO Quake. With LongTailPRO you can automate that process and get profitable keywords in a couple of minutes. What Are the Main Benefits of LongTailPRO? You can enter many seed keywords at once and receive results for all the long-tail keywords at the same time. Therefore, you can save a lot of time. You many want to generate results in relation to on your chosen CPC, search volume and other settings, like advertiser competition, number of words, domain availability, Google or Bind title competition. This way you can find a lot quicker what you need. When you find a golden long-tail keyword, you can increase the organic traffic to your website dramatically, by focusing the content on that keyword, with chances of ranking high in SERPs. There is a great support behind LongTailPRO, with demo videos, FAQ and ticket system. After you become a LongTailPro user, you can benefit from the knowledge and discussion with its community. and discuss anything with others. 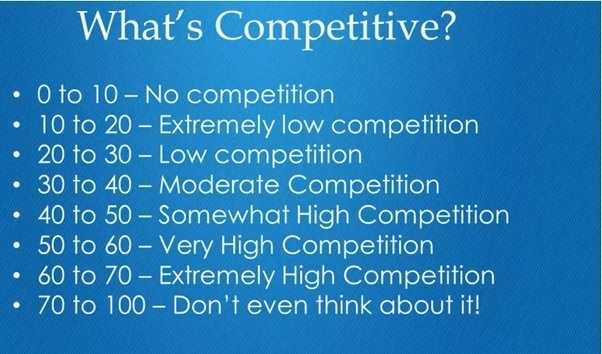 You may want to check keywords competition using different metrics, helping you ensure success. Check the keyword rankings of your site with the tool included, on Google, Yahoo and Bing. Before going into details, steps and screenshots on how to generate golden keywords with LongTailPRO, you should be aware that in order to get the most out of this tool, you need to go for the platinum version. Talking with the developer of LongTailPRO, I got a special 20% discount for NPI readers, which will be a limited time offer. Click here to get the offer and get profitable keywords today! Once you have chosen your plan and installed the software on your computer, be sure to have both accounts at Google Adwords Keyword Planner and at Moz. In order to start the research of the keywords, LongTailPRO asks you to login to your Google Adwords Keyword Planner Tool. If you don’t have one, you can simply register here: https://adwords.google.com/KeywordPlanner. 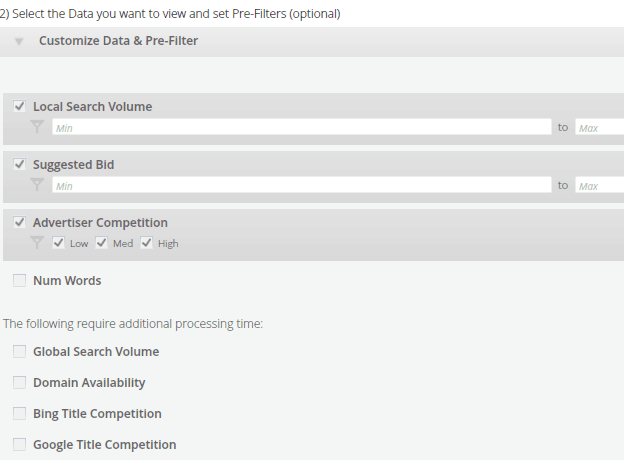 If you have a platinum version of LongTailPRO, you can get Keywords Competetiveness (which is great to understand at first glance if you will be able to beat competition or not). Let’s see, step by step, how you can generate profitable keywords using LongTailPRO, 3.0 version. As mentioned before, one of the great features of this tool is to be able to generate results from one or more seed keywords at once. But where to find these seed keywords? I suggest you to start from your interests. Make a list. Something you are expert in, or passionate of. Remember that, unless you hire a professional writing service, you need to be able to write at least 10, or better, 15 articles of high quality content for your niche site, plus 1500-2000 words for the main page. There are many places where you can start, like Google Trends, Amazon Top Sellers, Reddit, Yahoo Answers or Quora. See how many seed keywords ideas? Just choose one (or more than one) and add it to LongTailPRO. After you enter the name of your project, let’s say “Amazon Niche Site Project”, I choose 3 seed keywords and added to LongTailPRO: “knife”, “survival knife” and “knife sharpener”. And clicked directly “Generate Keywords & Fetch Data”. After you click on “Generate Keywords & Fetch Data”, you just need to wait a few minutes to get the results. Now you have to “play” a bit to find the golden keywords! 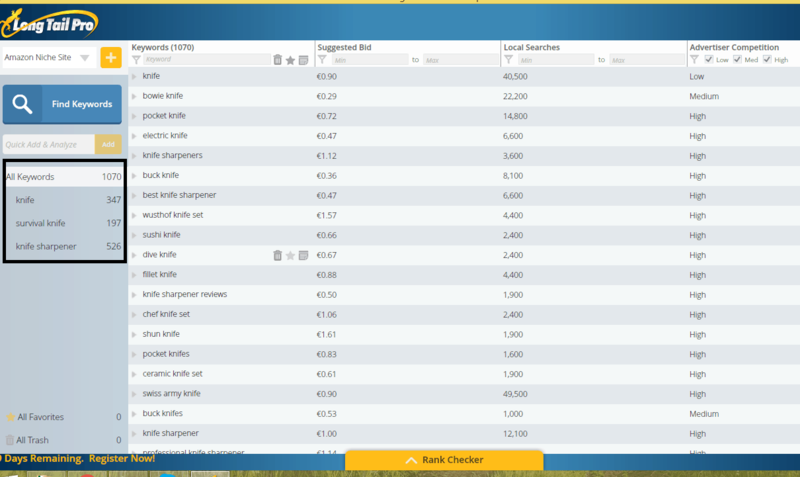 With the new version of LongTailPRO software I’m using (which as mentioned will be available to download in a few weeks), you can click directly on each keyword, to find the top 10 competition sites into details. I found out in the third line, this long-tail keyword: “how to sharpen a pocket knife”, which has 0,45 CPC, 1900 local searches (U.S. market), low competition and 6 keywords. I’m getting the Platinum version in a few days, so I’ll be able to see keyword competitiveness too (consider finding golden long-tail keywords with a KC score of 30 or less). Meantime, let’s concentrate on the other metrics and results. I like to keep things as easier as possible, so let’s see the most important factors to consider when checking the top competition for your chosen keyword. As you can see in the screenshot above, you can get at glance Page Authority, Juice Links, Domain Authority, Moz Rank, Page Rank and Site Age of competitors for the selected keyword (plus keywords competitiveness, if you get LongTailPRO). This feature of LongTailPRO gives you a complete analysis of data about these parameters. 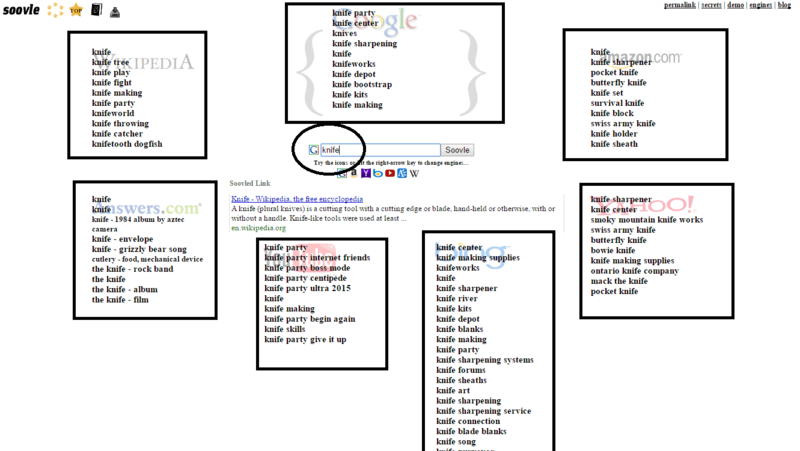 It plays an important role in finding long-tail keywords. 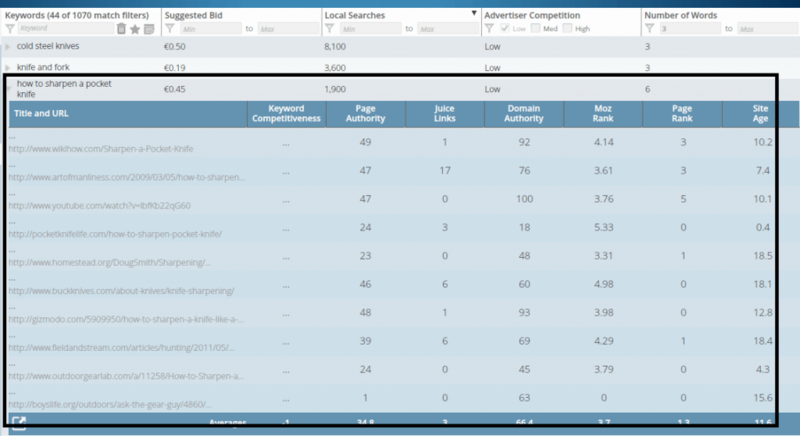 Keyword competitiveness goes in LongTailPRO in a scale from 1 to 100, where 1 suggests that it’s a simple to rank the keyword, while 100 indicates a highly competitive keyword. You should aim for a long-tail keyword with a low score, to ensure the success of your niche site. With LongTailPRO Platinum, the keyword competitiveness score is calculated in just a single click, through a software algorithm which consider the metrics of the web pages in the top 10 position in Google. Page Authority goes from 0 to 100 points, and it shows you the opportunities to rank the content containing the keyword on the single page. A high PA means that a specific page is authoritative. With a simple concept, you can think about a single page with high PA as a great potential to rank well in SERPs. This metric data comes from SEOmoz. Juice Links gives you information about how many links are pointing to that certain page (DoFollow links with a specific measure of authority). This is also a metric given by SEOmoz. When finding golden keywords, look for top 10 results with web pages referred by low quality of links. Domain Authority goes from 0 to 100. A higher score means the domain is more authoritative. Like Page Authority, but regarding root domain. This is another metric calculated by SEO Moz. Moz Rank is a link popularity score that shows the value of a specific page over the internet. This metric is based upon the total number and the quality of other web pages linked to that page. Higher Moz Rank shows a great quality of incoming links on that webpage. It goes from 1 to 10, and can be increased working with SEO techniques. Despite Google said is not longer used, Page Rank for older domains is still showed and can be used as a parameter for evaluate the importance of a specific page. It goes from 0 to 10 points. A good rule when searching for great long-tail keywords via LTP is to make sure that none of the top 5 sites have a page rank of 3+ and at minimum two pages with Page Rank 0 in the top 10. The Site Age simply shows the years passed since domain registration. You know that Google consider site age as one of the 200 factors to rank a website in SERPs. The following suggestions are not included as a metric in the software, but will help you finding golden keywords! This is quite the most important factor to consider. Be sure to check if in the title and URL of the page there is the keyword. Plus, check the meta tags and the relevancy of the site content. Put yourself in the shoes of who is building a site and ranking for a specific keyword. Well, working on SEO page, of course, and writing relevant content, which means adding your keyword in the title, description, headline and URL. Now, if you find a web page in the top 10 results, which are NOT doing this, well, there you go, you have one less competitor. This is quite simple, but important at the same time. If you are lucky, you can get keywords, with the top 10 pages with no SEO. This about this, for user generated sites. And it happens many times. If you are going to create a niche site, consider that people prefer purchasing exact match domain (no, you won’t get penalized by EMD, simply you’ll get fewer benefits that before this Google update). Trick: if you find that the exact match domain is available, then with high probabilities no one is working on that keyword, which means no competition. If you want to include an additional income to your online activities, building niche websites that make money in autopilot or your simply need to get more targeted organic traffic to your blog, by optimizing your content for long-tail keywords, I strongly suggest to get LongTailPRO today. As you have read in this review, it’s possible to understand how this tool works, to get the most out of it and finally crack some SEO secrets. The software is usually priced at $97, but you can get now LongTailPRO with a discount for NoPassiveIncome readers of $20 Off! This Special Offer Ends Soon! Awesome guide to LTP. I love to read such guides as it helps understand the things in step by step manner. The best thing LTP provides is it provides keyword competitiveness for organic search which Keyword planner doesn’t provide for organic search. Glad to see you here, Atish. Once you learn to use LongTailPRO, you discover the great potentialities of this tool. Getting profitable keywords is the first and most important step, when building niche sites to make money or to simply increase organic traffic to your blog, with long tail keywords. Thanks for visiting and commenting..
You have made me to love LongTailPro! I will plan to buy this software soon! I have been following Spencer from awhile and his software is the damn-best in the market, seems a big competition to Google’s Keyword Planner! I am studying about niche site’s building as I plan to step into this phase of the internet real soon, this guide of yours to detail out LTP is a perfect thing for me to steer LTP software! Pretty impressive and I am happy to share it on my social accounts! It took me a lot to write this detailed guide, with pretty nice tips and suggestions, in my opinion. I hope you will be able to purchase LongtailPRO, as it’s a must have tool, for any serious blogger. Finding profitable keywords and building niche sites, based on them, is an amazing source of passive income. I’ve been following Spencer too; the niche site case study I’m going to share soon is founded on the link building campaign he suggested in his site NichePursuits. I’ d say that you’ve crafted this post in a nice manner and nailed the topic too. Selecting the profitable keywords is a tedious blogging task but it could be made simple through LTP. I’ve been using this awesome keyword research tool since December last year and it is really good. As Atish said, its ability to determine the keyword competitiveness of the keywords is exceptional and I always select the keywords with high search volume and low KC. I’m trying to make use of LTP more effective to drive organic traffic to my blog. glad to see you and happy to hear you enjoyed the reading. and I really hope it could help some bloggers learn how to master this amazing tool. So you’re using it since last December? Have you got some nice results? I built a nice site, monetized with Amazon and it is going pretty well. Thank you so much for sharing your views here, Nirmala. I also appreciate the social shares. Amazing… and good guide how to work with longtail keywords…. your post caught me with some valuable points bookmarking this post for implementing in my blog.. thanks for sharing erik..
if you liked the content, be sure to try LongTailPRO software, to implement these strategies to your blog. Great article man! Surprised to see 3.0. Overall, Long Tail Pro has been a huge part of my SEO content strategy. Easy to use and you cannot go wrong with it! I love how it works and Spencer (and team) is great in getting the job done and support. good to hear you are already using LongTailPRO too. And yes, this 3.0 will be the new version, released to public since next July. To people who are going to purchase it right now, they will get the next version included, when available. Thanks for sharing your views, mate. Have a good rest of this week! Hey, bro…! That was an awesome tips abut LongTailProm. Honestly, I’ve read a lot of reviewing and tutorial about this tool but yours is the most detail and make me clear about LognTailPro. good to hear you liked the post. Are you going to try our LTP? Hey, bro…! I think that for sure..
And let me know if you need any help! First of all thanks for sharing such beneficial information with us. As you said, I’m too using Google Keyword Planner but after reading such detailed review of Long Tail Pro, I’m willing to go for it. I’ve already downloaded trial copy of LTP and planning to buy it soon. Surely its results are more accurate and necessary to use. good to hear this guide invited you to try LongTailPRO. As mentioned several times in this page, it’s an amazing tool and it’s a must use for every serious blogger. Hope you are going to be able to get Platinum version. Firstly i would love to say an thanks for you to give awesome advice on how to choose keyword. This is one of the big problem for blogger to choose niche and good keyword for their site. I got totally clear idea how to choose an keyword. Also i understand how much benefit i can get from longtailpro. It is an amazing tools for keyword research and i just also loved this product and will using soon. Many thanks for your great effort. Glad you enjoyed my LongTailPRO guide, Yasin. Be sure to give it a try now! Its good to know that the LongTailPro tool is not in the 3.0 version. Its a great tool for niche marketing. Spencer Haw and the team are doing great work with this keyword research tool. Its good to know of the added benefits that would be accrued by users of this platform. Thanks for explaining in details how to utilize this tool for effectual niche marketing. I am expecting my awesome posts especially on the case study! Spencer did an awesome job creating LTP, right Sunday? I’m so glad you really enjoyed this guide! I am Kenny writing articles in a blog named as MuchTech. Well, I know keyword stuffing is bad practice to rank a keyword. From my view, Putting keyword in various forms like consisting synonyms and location can be fruitful. but density just should be 1-2%. Also could you please share onpage checklist? yes, I would stick with main keyword density of max 2% for a niche site. I need to write a post about onpage SEO checklist. I just installed SEO PowerSuite a couple of weeks ago and have yet to play with it. I’m going to see how it pans out once I start implementing it. If it doesn’t go well, then I may take a gander at LongTailPro. You’ve convinced me with all the detail you provided with this program as well with the information of how to look up good keywords for your site. Thanks for the information here Erik! Have a good one! Good luck with PowerSuite and if you don’t like it, you can still try LTP, as you have the complete tutorial here. Thanks for visiting and reading, Sherman. Well I have tried longtailpro couple of months ago and I couldn’t use it further due to its monthly bills or I haven’t utilized it completely. The points regarding the longtailpro are very useful. but also for getting long tail keywords to optimize the content and traffic of your main blog. Its a really helpful post about using Long Tail Pro.I have never taken keyword research seriously but i just started keyword research because now i got to know it is the very first thing we need to do when we are thinking to start a new blog or post. I found the tool very helpful and i am ranking on first page of Google for some keywords. Thanks for sharing this great article sir. so good to hear you are getting awesome results with LongTail PRO. I use it mainly for finding profitable keywords to build niche sites. Great, let me try. by the way is there any way to get bulk competition score status. in long tail pro it looks like we need to do manually click each keyword competition area. any solution for that? Is it buying MOZ pro can solve this? do you mean getting an average competition score status? looking at the competition details. Well LTP is a must have tool these days and you have proved that again with this such a great post. really liked they way you compilled all the hidden features of LTP. I hope this guide of LongTail PRO is going to help you getting the most out of this awesome tool. am using Google keyword Planner for my Blog but How can we get keywords which pay high cpc ? Why don’t you give Long-Tail PRO a try? You can find what you need with this tool. Glad you found the post interesting, Jahangeer. You should know about keyword difficulty too because You will know how much money and force need to spend for achieve goals. Thanks for the post about Long Tail Pro. I gave it a shot and it is pretty decent. Will definitely look into using it some more. 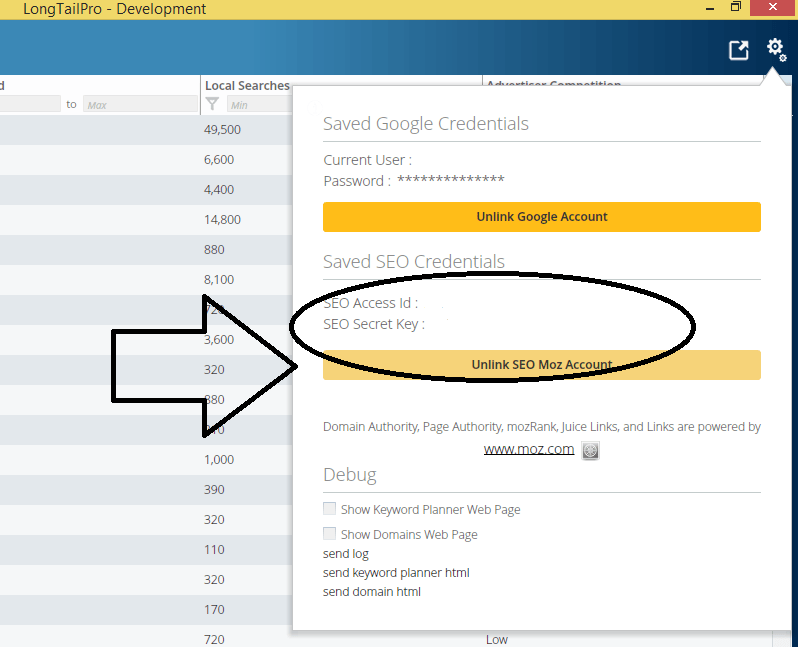 As for now, I am using KeywordTool.io and Keyword Heaven’s Longtail Keyword Finder. I especially like Keyword Heaven’s tool because it offers some free uses with full functionality.